These tutorials will help improve your cotton spinning and carding skills! Welcome to the world of cotton spinning! For millenia, humans have had a close and vital association with cotton, but during the 20th century much of the knowledge about hand spinning cotton fell from general use and cotton became a fiber that spinners shied away from. 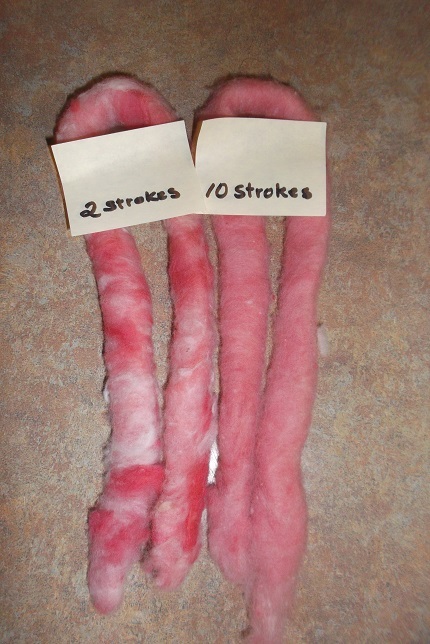 I have included a variety of articles on many aspects of working with cotton - you can find tips on spinning, dyeing, and weaving with cotton (see articles located under "Spin") as well as information on growing your own cotton from seeds (see "Grow") to help you along your journey with this interesting fiber. "I was recently spinning some Sea Island Cotton from Cotton Clouds and switched to Acala, also from Cotton Clouds and both listed as “Easy to Spin”! I was surprised that it took me a few minutes to make the switch! At first, I thought that the Acala cotton must have a shorter staple length. But, I tested what I had and they basically seem the same. That, of course, got me to thinking of the ‘fineness’ factor of cotton! Was cotton measured in microns, like wool? According to Cotton Inc., "Micronaire (MIC) is a measure of the air permeability of compressed cotton fibers. It is often used as an indication of fiber fineness and maturity.” In the spinning world, however, I’ve never seen cotton listed with a micron (or, micronaire) count like you would wool! Just curious to know if I’ve missed something or is the difference so small it’s insignificant? Yet. . .I did notice a difference! In fact, the Acala reminds me of bunny fur!!" 2018 has been such a busy teaching and traveling year, I did not have time to weave all year. So, when a friend asked me to house-sit for her last month, I thought what a great opportunity to take my little rigid heddle and get some weaving done. It has been several years since I had touched my rigid heddle so I started practicing with some Brown Sheep wool yarn that I had from years ago. After making two wool scarves I was ready to use my handspun cotton. So, I moved from a 7.5 epi to a 10 epi heddle as my cotton was equivalent to about a 4/2 size commercial yarn. 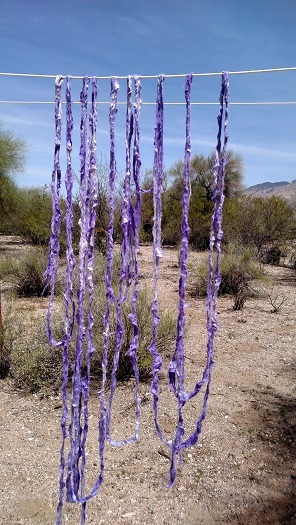 The purple yarn for the first scarf was spun from some sea island sliver that was solar dyed in a jar one day in May (see photo below this article). I did not scour the sliver before putting it in the jar with the dye, salt and water but did put a few drops of Dawn soap on top before closing the lid. It only took the Arizona afternoon sun a few hours to dye the sliver. Since I did not scour the sliver before immersing it in the jar, some of the cotton fiber did not take the dye. This gave me a heathered look when I spun it into yarn. I threaded it five and a half inches wide and using just one heddle, did tabby weave except for accenting each end with Brooks Bouquet lace pattern. The narrow white scarf with green highlights was carded using Upland White cotton lint with some natural green lint and a touch of brown lint from cotton I had grown. I carded it lightly and made punis before spinning it into yarn. 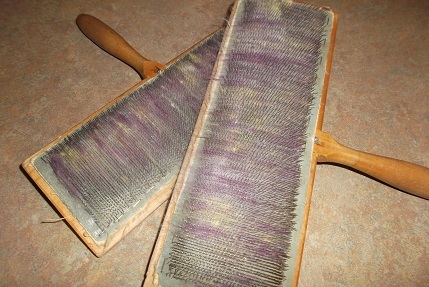 This I used as the warp with my 10 epi heddle and threaded it four inches wide. I knew it was a little wider spaced than I wanted but I did not have a 12-dent heddle. Thus, I counted on it drawing in when I washed it, ending up with a three-inch-wide scarf. 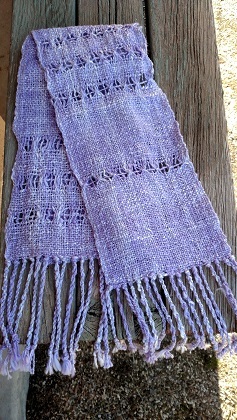 The weft was from Upland White sliver spun Z and plied S. As with the other scarf, I finished off the fringe by twisting groups of 4 threads each. Since the narrow scarf is more for decoration, I found a lovely little stick pin to hold the scarf in place. Recently, former student Peggy Mitchell sent me an inquiry asking me to clarify the differences between a puni, sliver and rolag and whether it is possible to make a cotton sliver using hand carders. What great questions! Here is a short overview of cotton terms to help you "talk cotton" with ease. Cotton is first described as a boll, that is when then it is ready to pick from the field. After the seeds are removed at the gin, then it is called lint. 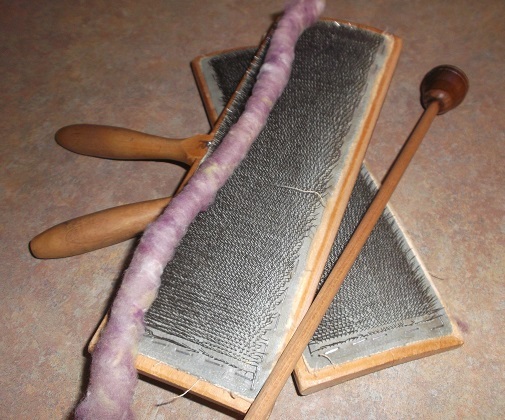 Spinners take the lint and card it into a puni in which the fibers are rolled. Sliver is lint is processed at the spinning mill on a huge drum carder, lining up the fibers, and putting them into a narrow strip. Roving is made when a slight twist is put on the cotton sliver but so slight that you can still draft it out to spin it into a yarn. Because cotton fiber is so short, it is almost impossible for us to make a cotton sliver by hand. With wool, the fiber is long and we can comb it and make something similar to sliver - the fibers are then all going in the same direction. Now available as streaming videos! 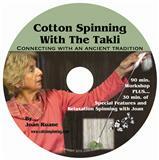 Joan has partnered with TAPROOT VIDEO to make her popular cotton spinning videos available to watch on-line. They are available as either streaming video by itself or a combination DVD/streaming package at TAPROOTVIDEO.COM. Using dyed colored lint you can create your own designer yarn easily. One thing for sure, it will be yours alone and it can't be bought in the yarn shops. To review how I card, click here to go to the article "Carding Cotton Lint & Making a Puni". To get creative colors I usually start with a little white lint on my carder before adding the colors I want. Following my directions for carding, you do the same except you might like to shift your top carder a little to the left or right, helping to blend the colors a little better. When you are happy with how much you have blended the colors then remove them with a thin dowel, rolling it into a puni. Note that the more you card, the more the colors will blend together. 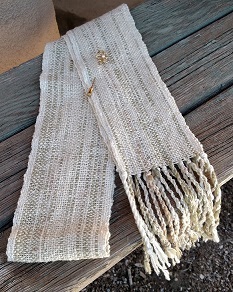 Weaving with handspun cotton singles presents its own challenges and rewards! Over the summer I wove up a scarf using handspun singles and wrote up a description of my project step by step as I worked it through. 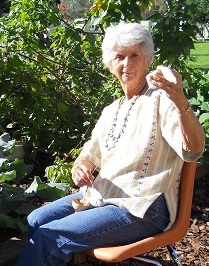 "EASY TO SPIN" COTTON SLIVER MAKES HAND SPINNING EASY! Are you frustrated with your cotton spinning? Most cotton preparations are carded for machine spinning and difficult to spin by hand, especially for novices. Joan's Easy to Spin sliver has been prepared with handspinners in mind. Make your life easier and try this wonderful fiber. Due to the extensive amount of travel involved in my teaching schedule, early in 2013 I accepted the gracious help of Jill and Lura from Brookmore Creations to handle the demand for Easy to Spin cotton sliver. They now handle the wholesale distribution of Easy to Spin cotton sliver so that many shops around the country as well as Canada and New Zealand can have this luxurious cotton sliver available for hand spinners. Click here for more information and the updated U.S./Canada and New Zealand vendor list. TAKLI SPINNING - WHAT MAKES IT SO SPECIAL?